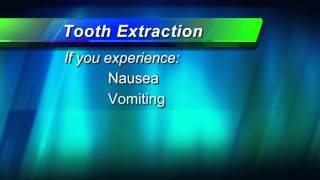 If a tooth can't be saved, your Issaquah dentist might recommend an extraction. Your dentist in Issaquah will inform you when a tooth requires extraction and request that you make an appointment for this procedure. Dr. Vanama needs to know your complete medical history before she can pull your tooth, including any medications you take. She will request that you provide this information on a written form prior to the procedure. When you come in for the extraction, the first thing Dr. Vanama does is numb your tooth and the gum area surrounding it with anesthetic. This is necessary so you don’t feel pain during the tooth extraction process. Once the anesthetic has taken effect, Dr. Vanama expands the socket of your tooth and separates it from the ligament that holds it in place. Your dentist in Issaquah applies continuous firm pressure with forceps or a dental elevator to complete the expansion. This loosens the tooth so that it comes out quickly and easily. After the tooth is out, she places gauze in the gap it left and asks you to bite down firmly. This controls the bleeding, which can be significant immediately after the extraction. She will also rinse the area to ensure no fragments of your tooth are left behind. It was not easy to choose a dentist. I was nervous. But doctor spoke to me very calming. Explains to me every little details and made me a crown. I hope everything will be alright. Good service. Convenient location. Modern equipment. It is normal to feel some tenderness and pain in your mouth for the first few days after an extraction. Dr. Vanama will let you know the type of pain reliever you should take and how often you should take it. Non-steroidal anti-inflammatory drugs (NSAID) such as ibuprofen work well, but aspirin may cause prolonged bleeding. You can expect oozing from the extraction site for about the first 24 hours. Keep a package of gauze handy and bite down on it whenever your notice bleeding. If your bleeding or pain persists, please contact Dr. Vanama right away. We'll do everything possible to make sure you're comfortable.